Influenster sent me a Voxbox of different products to try out. Dr. Scholl's For Her Ball of Foot cushion was included. Wearing high heels is difficult for me. My feet hurt after a few minutes. I have tried so many different products to help with foot pain. Nothing has helped before now. This is a gel cushion that stays in place and is so comfortable that you don't even know you have it in your shoes. It prevents your feet from sliding forward and your toes from getting squished up in your shoes. You feel like you are getting a mini massage with every step. 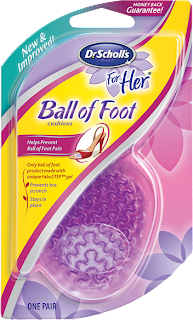 This is a wonderful product if you wear heels. Run out and get them. You won't regret it. Sounds like I need this! These work really well. So happy to have received them also to try.